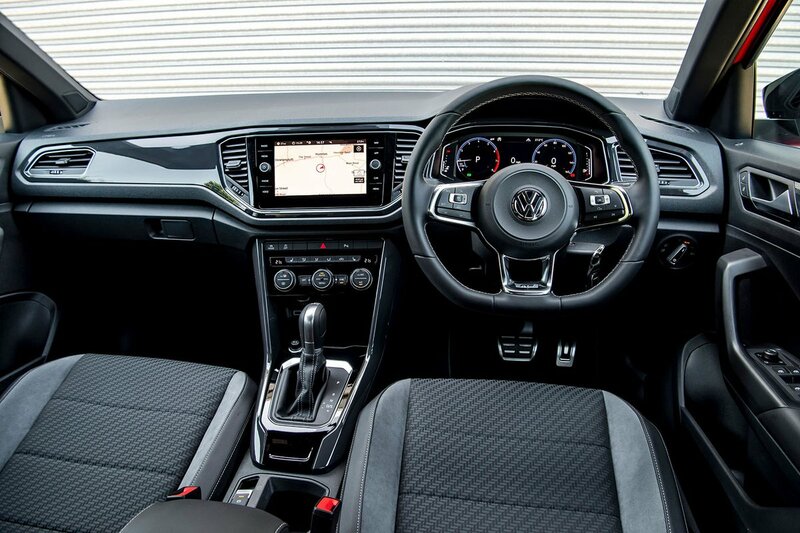 Volkswagen T-Roc Interior, Sat Nav, Dashboard | What Car? Getting comfortable in the T-Roc is easy thanks to its wide range of adjustment for the seat and steering wheel. It's a pity that there's no standard adjustable lumbar support on any trim, but at least you can add it (on all but the entry-level version) for a nominal sum. 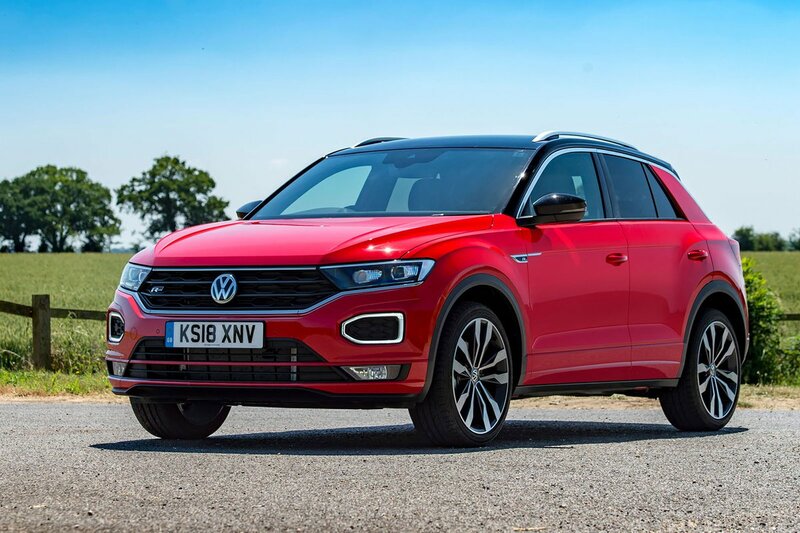 If you like to sit high up, the T-Roc puts you a bit farther from the road than lower-riding small SUVs that include the Seat Arona and Kia Stonic. If a lofty driving position is your absolute priority, though, try looking to the family SUV class instead: the Nissan Qashqai should do the job. The optional Active Info Display (standard on range-topping SEL trim and optional on SE and Design) replaces conventional analogue instrument dials with a screen that presents a vast amount of information very clearly. It can even show you a full-width sat-nav map, assuming you have sat-nav fitted. That relatively lofty driving position, combined with slim windscreen pillars, allows a great view of the road ahead. Rear visibility is more restricted so you’ll be glad that front and rear parking sensors are standard (on all but entry-level S trim). That said, the T-Roc is still easier to see out the back of than the Arona and Hyundai Kona. There’s also the option of a reversing camera or a bird’s-eye-view camera to make it easy to see how close you are to obstacles. You can even add a self-parking system that’ll tell you when it's detected a big enough space, before robotically steering you into it. Bright LED headlights that offer great illumination at night are standard on range-topping SEL, but are a pricey option on all other trims. The T-Roc's standard touchscreen infotainment system is the same 8.0in unit that you'll find in the VW Golf, but because it’s positioned higher in the T-Roc, it’s easier to keep half an eye on the road while operating it. 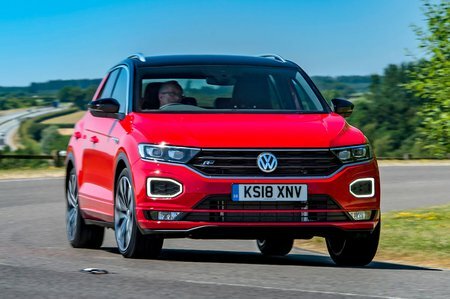 This is just as well because VW has done away with physical shortcut buttons of the kind you can feel your way around after a little familiarisation. Instead, the buttons either side of the screen — for directing you to the various menus — are touch-sensitive, which look smart but require that you study them to make sure you can find the one you need. Otherwise the system is great to use, responding quickly to screen-prods and providing well structured menus that prove a doddle to navigate. What's more, Apple CarPlay and Android Auto smartphone mirroring comes as standard on all but entry-level S trim, where it's a reasonably priced option. It’s worth noting that sat-nav is a very expensive option on all but range-topping SEL trim. You also have to pay extra for wireless phone charging on all trims, which comes as standard on some of the T-Roc’s rivals. Chances are you’re expecting the T-Roc to look and feel quite posh inside. After all, VW has a history of providing upmarket interiors – even in models like the much cheaper Polo. It comes as a bit of a shock, then, that interior quality is actually the most disappointing aspect of the T-Roc. It feels surprisingly cheap with hard, unyielding plastics the order of the day throughout. Quality is roughly on a par with the cheaper Arona and a world away from the plusher Audi Q2 and Mini Countryman. This is one or the reasons we reckon the cheaper end of the T-Roc range makes the most sense. At least you can brighten up the interior with a selection of body-coloured dashboard inserts (included in the price) and the option of super-slim ambient lighting strips.